5,200 active-duty troops are headed to the border. And that’s on top of the more than 2,000 members of the National Guard and all the border patrol agents who are already there. Their mission? Stop an exhausted group of children, women, and men fleeing danger and seeking protection at our border. And now we’re hearing that Trump might announce even harsher measures in a speech later this afternoon! This is an enormous waste of money and, frankly, an inhumane response from our government. This is not who we are as a nation. Speak out on Facebook and Twitter! At least one in four of those walking in the caravan are children. Many are families. This is also not a border crisis. Border crossings remain at historic lows compared to past decades, even with the recent slight increase. Honduras cannot legally stop its citizens from leaving. No country can. It is not a left or right-wing conspiracy to push for “open borders” or influence elections. It is not about the United States. This is about life or death for these people. We have more FACTS to answer your most pressing questions and they’re straight from sources on the ground. Read them here. This caravan isn’t a security threat. It’s a humanitarian crisis, and it will only get worse if the Trump Administration meets them at our southern border with a cold heart and a heavy hand. 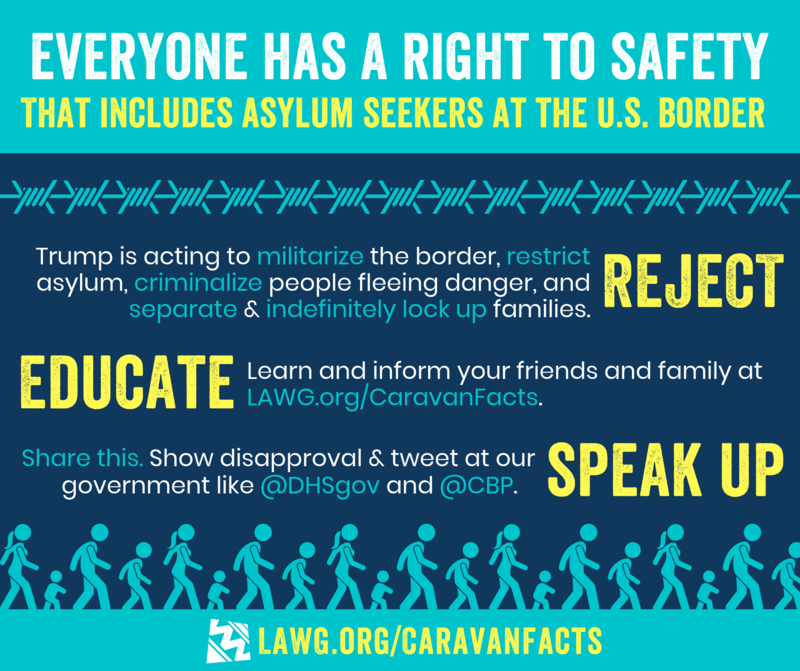 Tell your friends, family, and our government that you reject border militarization, welcome asylum-seekers, and demand protections for them! And make sure that they know the facts! Click here to share your views on Facebook. Click here to share your views on Twitter. Seeking asylum is a right under U.S. and international law. Period. And many members of this caravan are in need of protection because they’re fleeing from violence perpetrated by gangs and organized crime as well as political repression, poverty, and environmental disasters. Yet this administration is hellbent on denying them their rights and limiting the rights of all asylum-seekers and migrants. Trump only sees the lives of those in this caravan as a tool to advance an anti-immigrant agenda and justify militarization. We see it as a call for American compassion and protection. Join us in speaking TRUTH about these people in need seeking protection at our border and urge compassion and protection as the response worthy of our nation. Join us in calling for humanitarian and rights-based solutions, NOT increased militarization. P.S.Stay tuned for other ways you can act to protect immigrants and refugees and stand up against indefinite family detention!